Hero Arts SHADOW INK Pad SOFT BROWN AF170 at Simon Says STAMP! 61172 /2.2 This item is on reserve until If you would like to reserve this item now, you may purchase it now with the rest of your order. We will hold your order now and ship your entire order as soon as this item is back into stock. If you would like your order to ship now, please place this item on a separate order. Success, Hero Arts SHADOW INK Pad SOFT BROWN AF170 has been shared! A shadow ink offering subtle washes of color, ideal for backgrounds and stamp layering. Water-based, acid-free, archival, and fade resistant. 3.5 x 2.25 inch pad. Hero Arts is a design company, a family-run manufacturer, and a certified green business. Hero Arts runs a solar-powered and modern energy efficient facility making and distributing premium and original craft and stamping products. 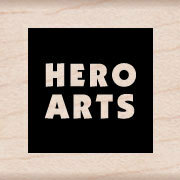 You always know that you have an authentic Hero Arts stamp from the Hero Arts logo to the top-quality craftsmanship.